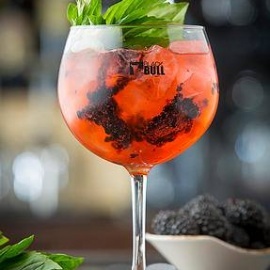 At Black Bull, we believe that ingredients have always been the stars behind Spain's culinary triumphs. Working at his father's butcher shop from a very young age, Chef Marcos Campos, himself a butcher since the age of 15, developed a passion for the gifts endowed by the land and sea, as well as a deep respect for the individuals that dedicate their lives to these noble trades. Chef Marcos explores the exquisite products and flavors found throughout Spain with a variety of dishes that represent the essential pleasures of his country's traditions and others that aim to provoke and surprise with innovative textures and techniques that he learned under the tutelage of the great Spanish chef Manolo de la Osa at his Michelin-starred restaurant in Cuenca, Las Rejas. Behind the bar, the Black Bull team has created the most comprehensively "Spanish" beverage program in the City, featuring a Sherry List with over 30 selections, Spanish-style GinTonics, Sherry Cobblers, House Cocktails infused with Spanish flavors, and a wide selection of Spanish beers. 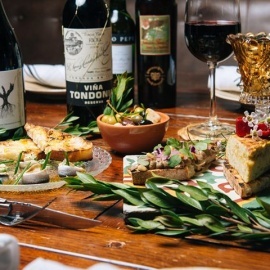 The wine program at Black Bull is an All-Spanish affair, with over 50 wines available by the glass and bottle showcasing small growers across Spain. Spanish small plates in a rustic-chic space with an open kitchen & a 2nd-floor bar with cocktails.